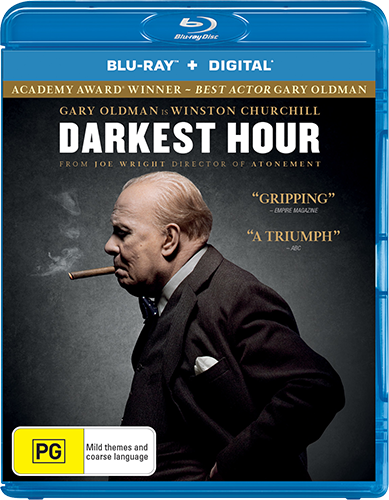 Win Darkest Hour: Gary Oldman is Winston Churchill in this Oscar-winning role | SWITCH. Academy Award winner Gary Oldman is Winston Churchill in the gripping and emotional drama 'Darkest Hour'. As Hitler’s forces storm across the European landscape and close in on the United Kingdom, Churchill (Oldman) is elected as the new Prime Minister. With his party questioning his every move, and King George VI (Ben Mendelsohn, 'Rogue One: A Star Wars Story', 'Animal Kingdom') sceptical of his new political leader, Churchill must face one of his most turbulent and defining trials on the precipice of World War II: exploring a negotiated peace treaty with Nazi Germany, or standing firm to fight the ideals, liberty and freedom of a nation. Also starring Academy Award nominee Kirstin Scott Thomas ('Tomb Raider', 'The English Patient') and Lily James ('Baby Driver', 'Cinderella'), with the most commanding performance from Oldman yet as the formidable parliamentarian. Click here to read our theatrical review of 'Darkest Hour'. The 'Darkest Hour' competition has now closed. Winners will be announced shortly. Competition opens at 5pm AEST on Sunday 15th April 2018 and closes at 11:59pm AEST on Sunday 22nd April 2018. Five winners will be chosen at random on Monday 23rd April 2018. To successfully win, entrants must fulfil the above entry conditions before the time the competition closes. Current members/followers are eligible to enter the competition. Only one entry per person. Only one winner per household. To be a valid winner, the entrant must not have won a prize from SWITCH within the last 28 days. Each winner will receive one Blu-ray copy of 'Darkest Hour'. By entering, you agree to receive occasional emails from SWITCH in the future. If you decide to unsubscribe from these updates, any further entries will not be applicable. Only Australian residents are eligible to enter. 'Darkest Hour' is available on Blu-ray, Digital and DVD on Wednesday the 18th April 2018 from Universal Sony.